WASHINGTON — FBI Director Christopher Wray appeared to provide the first official confirmation Thursday that the FBI has applied for secret FISA warrants in the Russia investigation — the type of warrants that can allow the bureau to spy on the email and telephone calls of specific individuals. 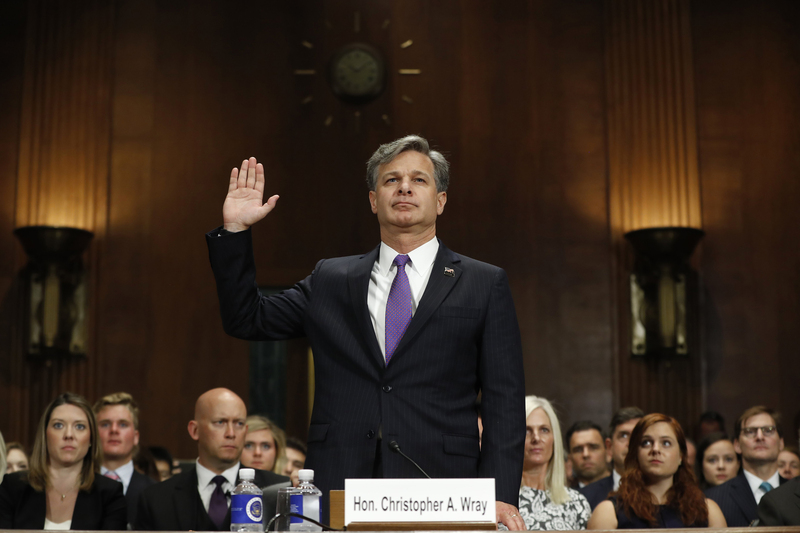 Testifying before the House Judiciary Committee, Wray was being questioned about whether the FBI would provide the committee with information about its applications for the secret warrants, which can grant investigators access to phone calls, email, web browsing history and other electronic records. Wray told lawmakers that he could not provide the information, but that the FBI "has been having extensive interaction with the Congressional intelligence committees on our interaction" with the Foreign Intelligence Surveillance Court. The FISC, as it is known, is the court that grants FISA warrants to the FBI, and with them permission to conduct secret surveillance of targets in the United States. The House and Senate intelligence committees have been receiving information from the FBI and other intelligence agencies as part of their investigations into Russian campaign interference. Wray's statement appears to be the first on-the-record confirmation that the FBI has applied for FISA warrants in its investigation into Russian election interference and the question of whether the Trump campaign colluded with that effort. The Washington Post and the New York Times reported in April that the FBI used a FISA warrant to monitor former Trump foreign policy adviser Carter Page. The warrants are classified, so government officials usually cannot discuss them in public. The FISA court grants permission to the vast majority of the government's surveillance requests, leaked documents have shown. "I do not believe that I can legally and appropriately share a FISA court submission to this committee," Wray told House Judiciary Committee members Thursday. He said the House and Senate intelligence committees provide the "appropriate settings" in which the FBI should discuss that sensitive matter. Rep. Bob Goodlatte, the Virginia Republican who chairs the Judiciary Committee, disagreed, and said his committee had jurisdiction over FISA. Spokespersons for the FBI and Special Counsel Robert Mueller did not respond to requests for comment.